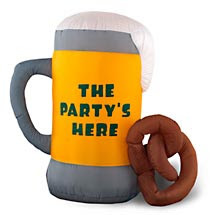 "This airblown beer mug with pretzel leaves no doubt that your partygoers have arrived at the right place. At four feet tall, this self-inflatable décor makes a fun statement. For indoor use only." I'm sorry, guys. But if someone has left behind a two-foot tall pile of feces, the par-tay is o-ver. God bless Walmart. They're slashing prices and keeping America super-classy! Evidently my cats have been leaving pretzels behind in their litter box. Who knew. You've *got* to be kidding! Anybody know a legal way to make $400 overnight?